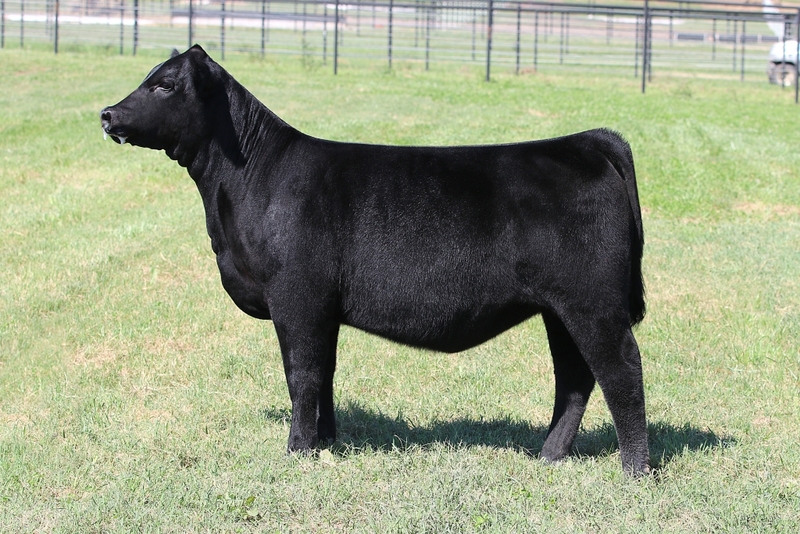 We feel there is no better way to start off our first sale since the merge of our operation with Bushy Park than with a knock ‘em dead Mainetainer female. This May born Style heifer is truly flawless in her build and skeleton! On top of her impeccable running gear, she opens up big in her rib and has a presence like she knows how truly good she is when loose in the pen, or on halter. Her full sister was Reserve Mainetainer at the 2017 Iowa State Fair. This February polled is the definition of a breed changer. It is hard to find cattle of any breed that blend bone, stoutness and a feminine maternal look like this one does. When you study this girl from the ground up you have to be impressed with the foot size and rugged bone work she’s got while still crossing the picture pen with grace and flexibility. 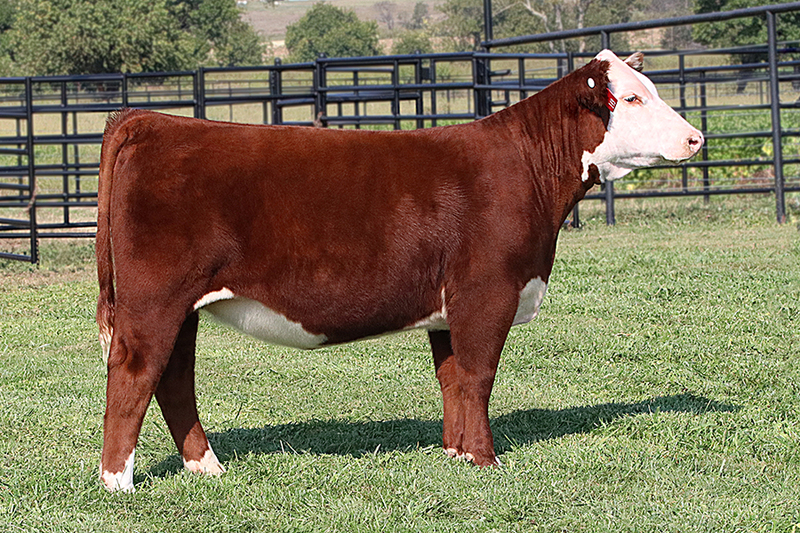 Her extra durable build is highlighted with a big, bold body shape and the extra pin width that so many Hereford cattle are deprived from. It’s sure not hard to see the shear mass and high quality phenotype this girl offers. 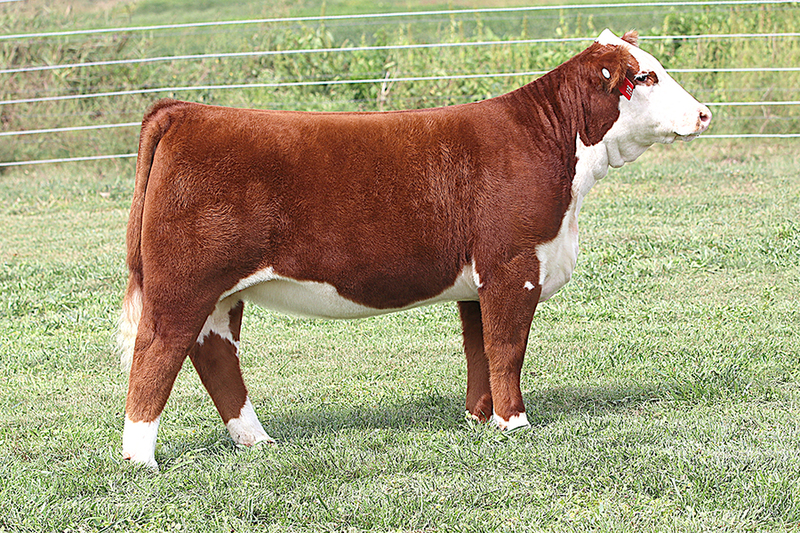 As a bonus, she’s bred with a Purple background, being backed by the U37 (Online) cow named Champion Hereford Female at the American Royal. This Maine Angus heifer calf has been a favorite around the farm for some time now. She’s the kind that judging coaches eat up! We have been sure impressed with the Blue Chip sire group and he sure didn’t miss here. 127 is a prime example of how influential this new Maine Angus program is going to be! She offers an upheaded stunning look of quality from the profile and blends so smooth into her shoulder, right into a big, sweeping rib cage. We are sure excited to see who ends up with this female. Backdrops are our favorite places to stand. Around here, we would rather make a cow into a show heifer than try to take a show heifer and make her a cow. 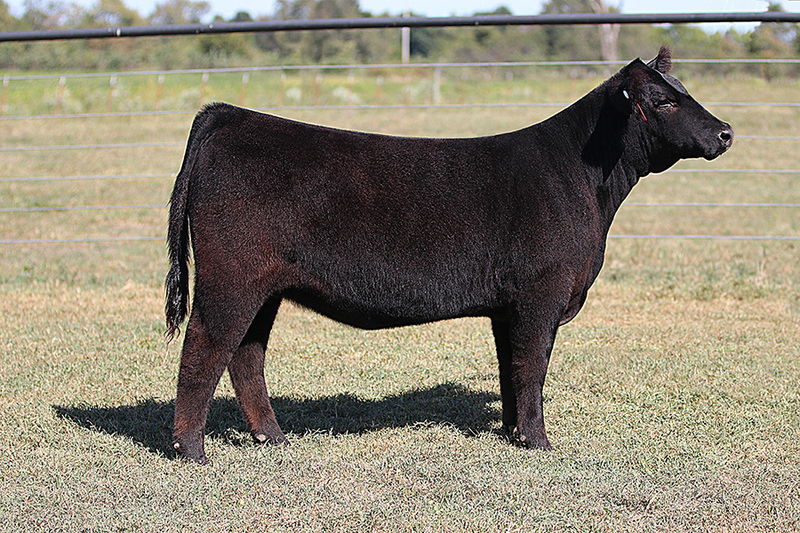 The bet is pretty safe on this Cash Flow heifer that she can get it done in and out of the show ring. Study this one’s video and you should find that her body and structural integrity alone will set her apart from the pack. 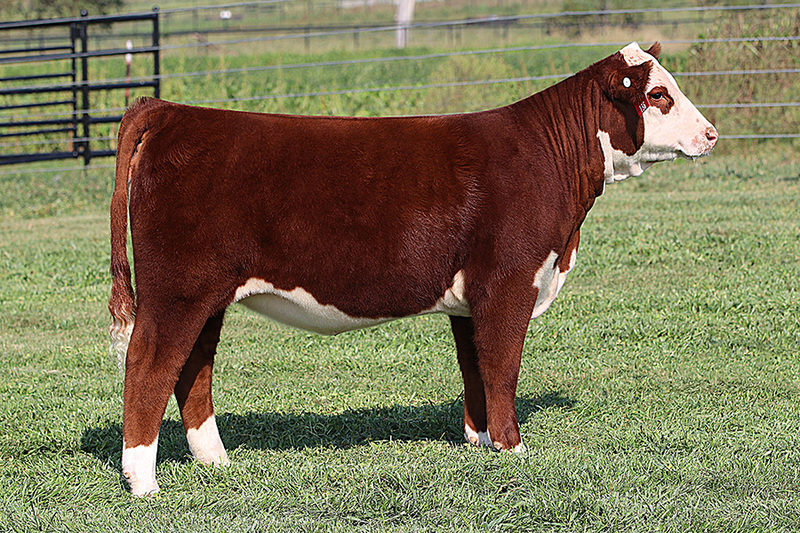 You will be hard pressed to find a better built or better haired Hereford female to sell this fall. Although she is pretty quiet and conservatively-marked, her presence on the halter is spot on. When her head is up, she looks loud, proud, and will catch attention in the ring or donor pen. 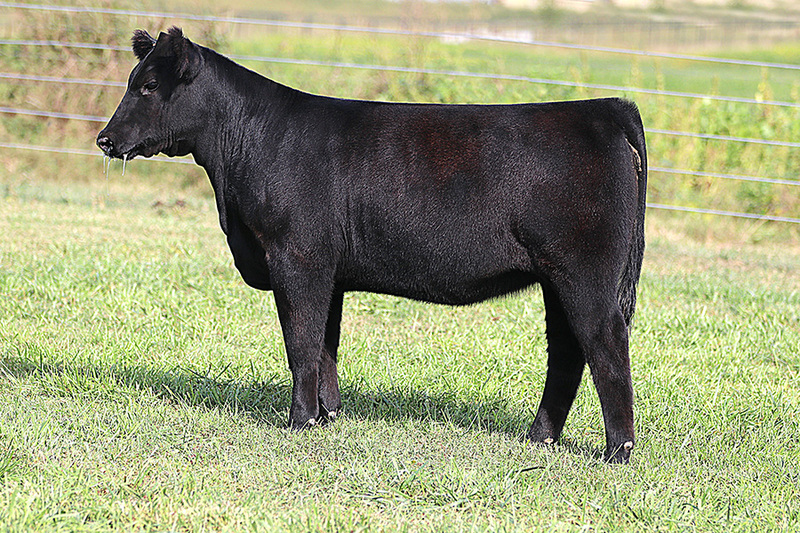 Another favorite since day one is this Style x Biscuit Sim Solution female who is bred to the hilt. 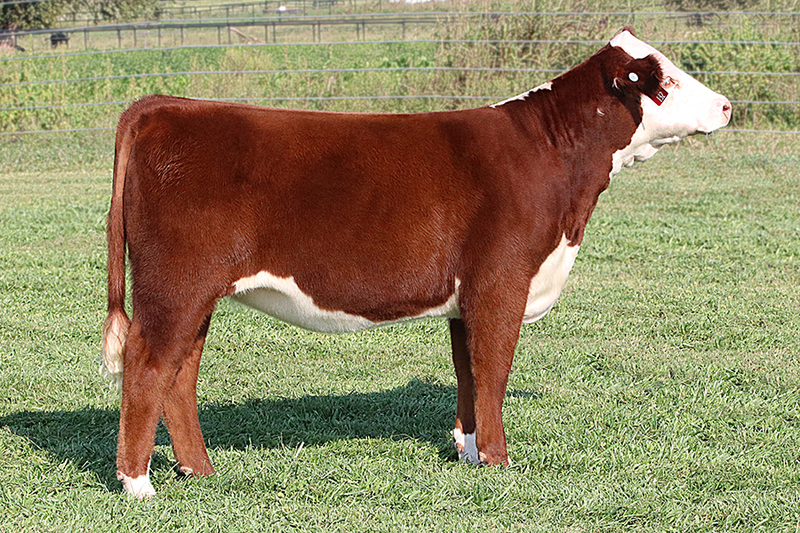 This heifers dam is a full sib to the Roller Girl heifer who won several major shows for the Vickland family, both heifers are generates of the 8543 cow who arguably is the best cow in the Simmental breed. Other than the fact winning banners is packed in this gals’ background, we think she will be no stranger of doing her own fair share of winning. 129 upholds the structure that is built to last with a super elegant and maternal look from the side. Study the picture and video and don’t get caught with your hands in your pocket on sale day. Irish Whiskey daughters are no stranger to success in the Maine breed. When put on Angus cows, he adds the perfect amount of punch and extra look just as found in tag 130. This female is out of the 777 Reimann cow who produces great ones year after year. The feet and legs on this female are second to none and she’s got that cocky upheaded look with extra body and mass that should trend her to the top regardless of where you want to show her. 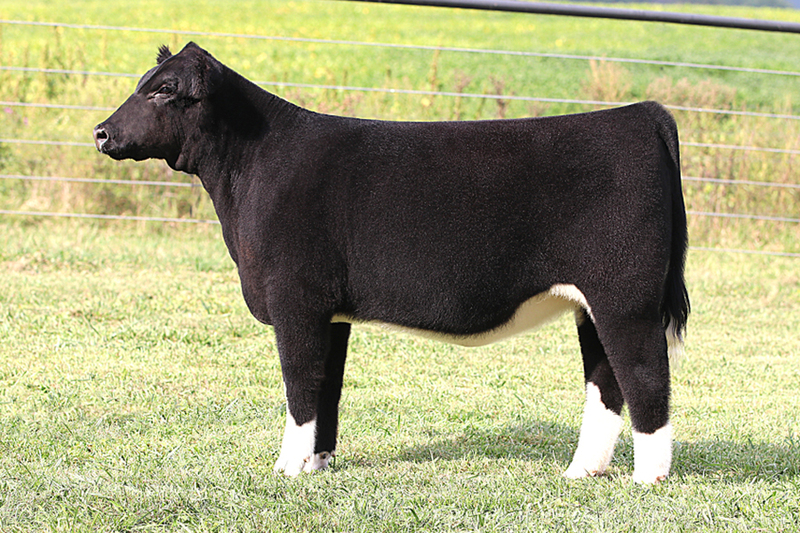 Any Chi Angus enthusiast should need no introduction of how exciting this mating has been in the past. The Style x 055M cattle have proven their worth in and out of the show ring, including the Junior National Champion of Max McClure’s this summer. 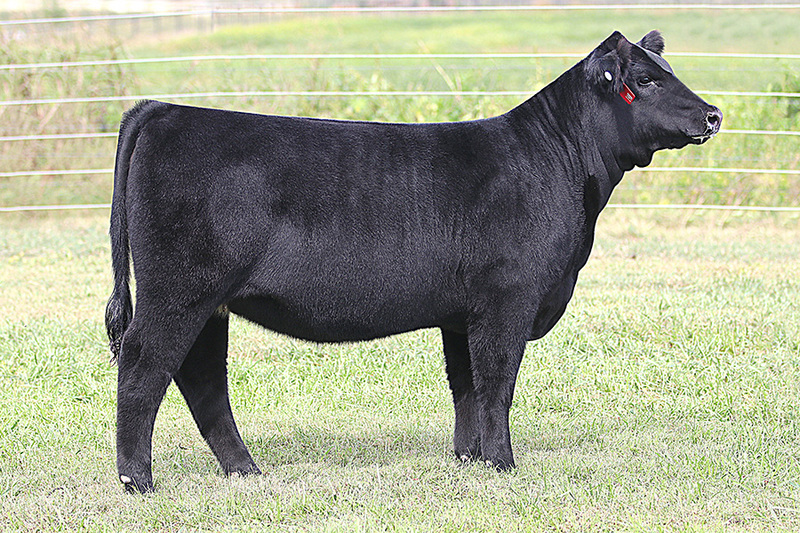 This January heifer has great big feet and moves them with great flexibility. Beyond her impeccable structure she is as rope necked, big bodied and maternal as you can make them. We are big on cow families, especially when it comes to our Herefords. 132 is a Home Brew out of the famous Bright Kessie cow family. This female is truly unique to the breed for how thin and freaky that she is from her shoulder ahead and has absolutely zero chest. She is the type of cattle that get better and better every day. Keep your eye on this cool bred one, she could sneak up later next fall and be a tough one to turn. “Socks” is the kind of Maine cattle that we have been striving to raise for years, and I honestly wish we had a hundred more of her. I dare you to come check this one out in person or on video and try to pick a hole in this females structure. This type of cattle here will make you want to take a trip to Arkansas, regardless of where you come from. She is so good at the ground and in her rib shape and body depth, yet she strikes a killer look from the side. 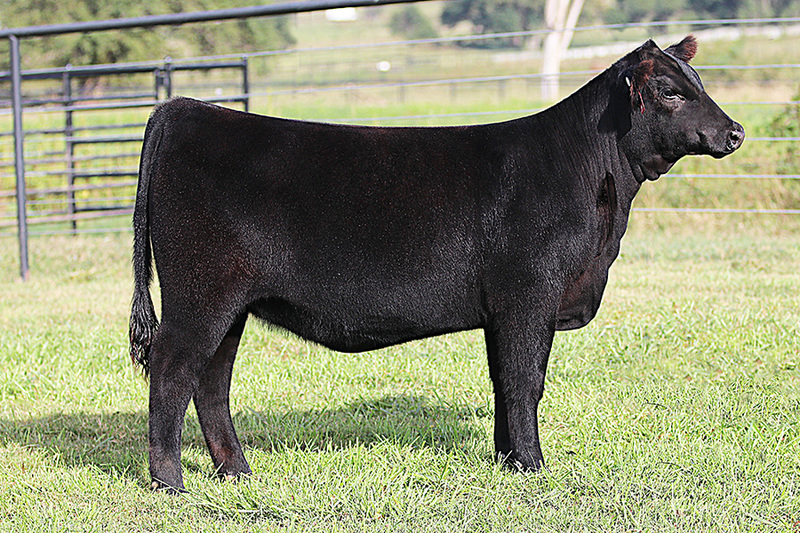 We know how hot Primo offspring are becoming and this heifers dam, an Unlimited Power x Roxberry, is one of our favorite new additions to the ranch. Look for this one to have tremendous success in the ring and then go to make your cow herd better after all her banners are hung. 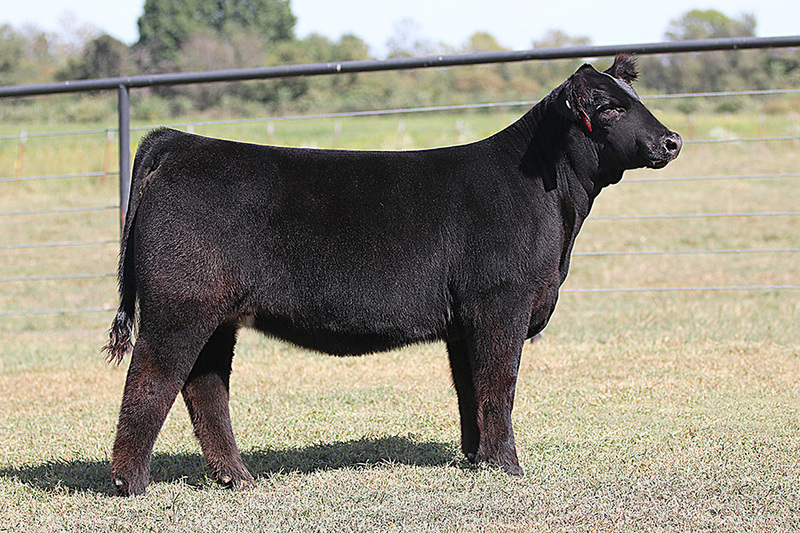 Full sib to our leadoff Tag 125, this Style x 189 star-headed female is another one that is sure to earn her keep. She’s big bodied and practical in her design and brings forth a shot more power and pin width from behind. Not to mention her added bone and growth should position her as one of the more unique Angus sired Mainetainers to hit the ring this year. 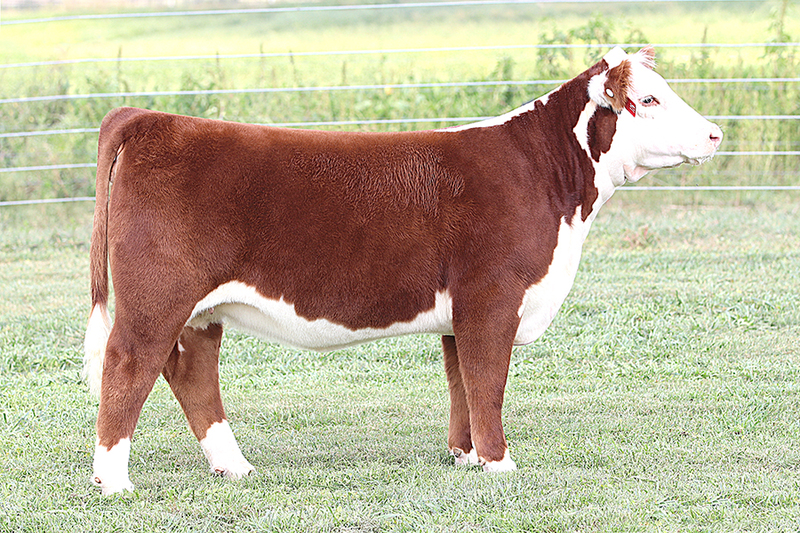 High percentage Maine cattle with easy doing looks and flexible feet and legs always seem to position themselves to the top of shows across the country nowadays; this Middle Man daughter is sure to catch attention in those regards. She’s supplied with the practical skeleton and body type coupled with extra look and power and hair. She is a daughter of 725T who has produced numerous high sellers in past Bushy Park sales, including the $65,000 King Maker bull. This daughter of 88x is a full sister to Whitney’s Bred and Owned shown last year who captured division titles at Kansas City, Louisville and Denver. 136 is built very similar to her sister: huge ribbed, flat shouldered and sound as an alley cat. She’s just an April, who’s in the perfect condition to get better every day. 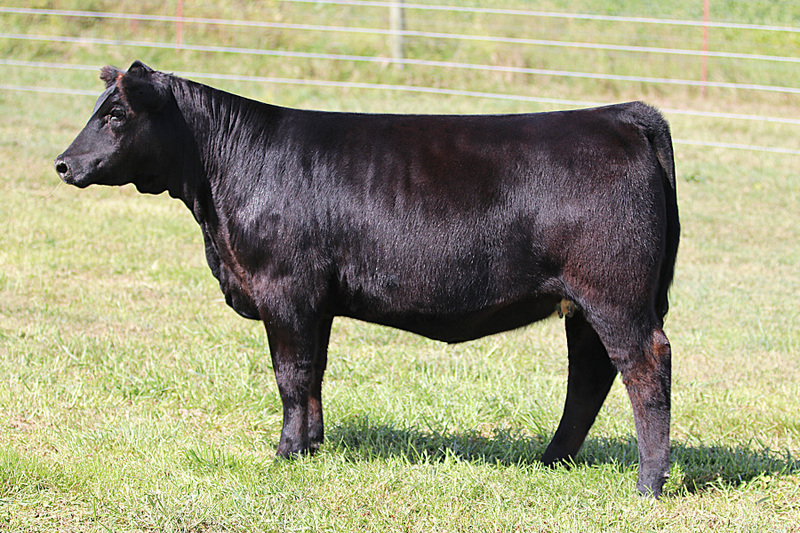 Just one Purebred Angus in this first sale, but a sure enough good one in our book! 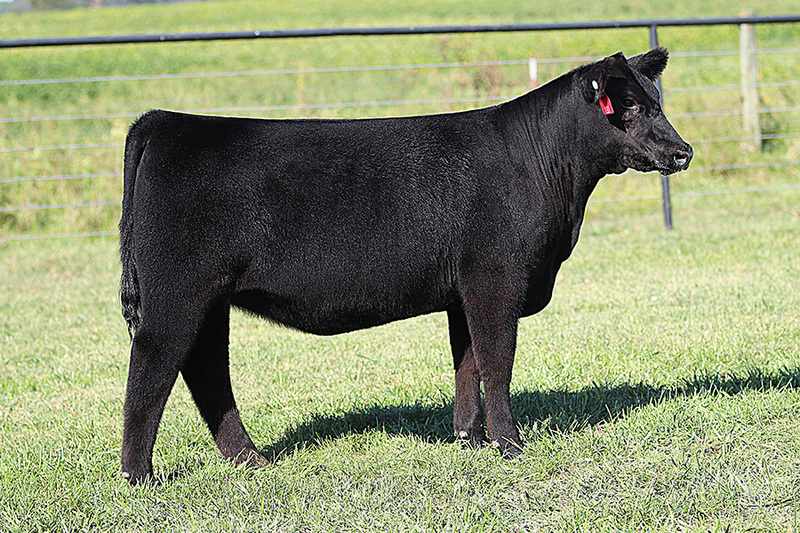 This Blue Chip daughter has the big, swooping rib cage and feet like an ox! She is the kind that can truly make you a lot of money in the cattle business. 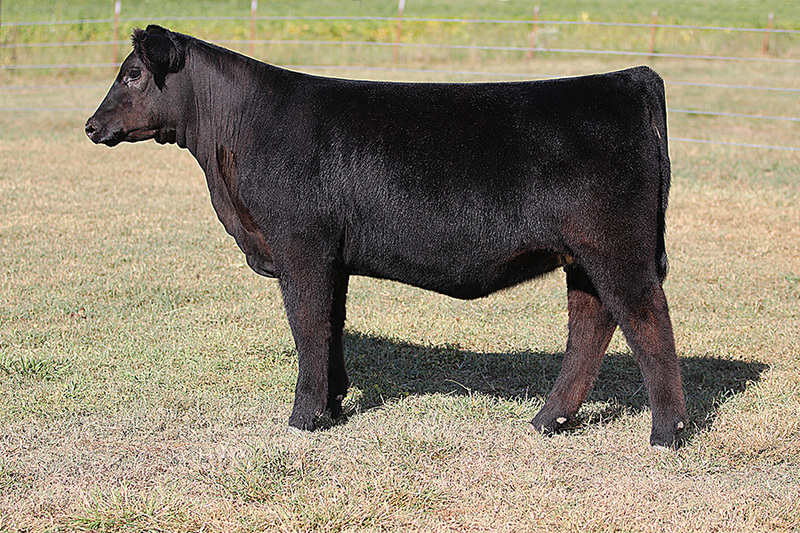 She is loaded full of quality that will get you across in the show ring. However we feel that her true calling will be in the donor lot. Your mating options are endless on this one. Bid to own. 138 is a really unique Slider female who has a killer look. She has sure been climbing the ladder fast here lately as the weather cools off and is starting to kick it into high gear. She’s as long striding and good balanced as any. Who doesn’t love a good baldy? This blaze faced beauty is sure to grab your attention when you first lay your eye on her. The rib shape and dimension found in this one is outstanding. She papers up to a ¾ Simmental, which might qualify as a high percentage at some state fairs. Yes, you read that right, she’s a ¾ Simmi, and she’s got a neck that’s out of this world! 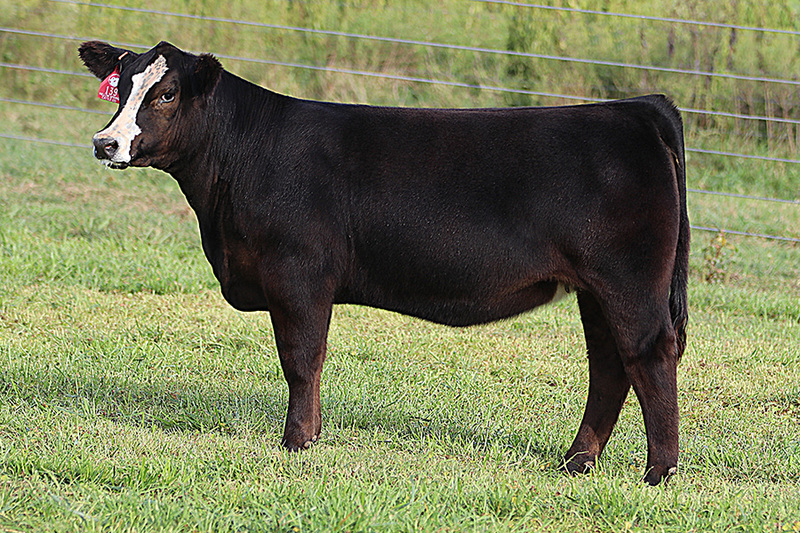 Once again a polled March female who has quite the genetic package to go with her streamlined and attractive look. 88x on an About Time x Harley, power in the blood here folks! She’s stylish, attractive and built for speed. Dual registered jackpot machine here in this Daddy’s Money heifer. If you are a sucker for the big legged, sound and hairy kind with more punch than Muhamad Ali…..here’s your girl. 141 will compete on any level with her extra stoutness and eye catching presence. 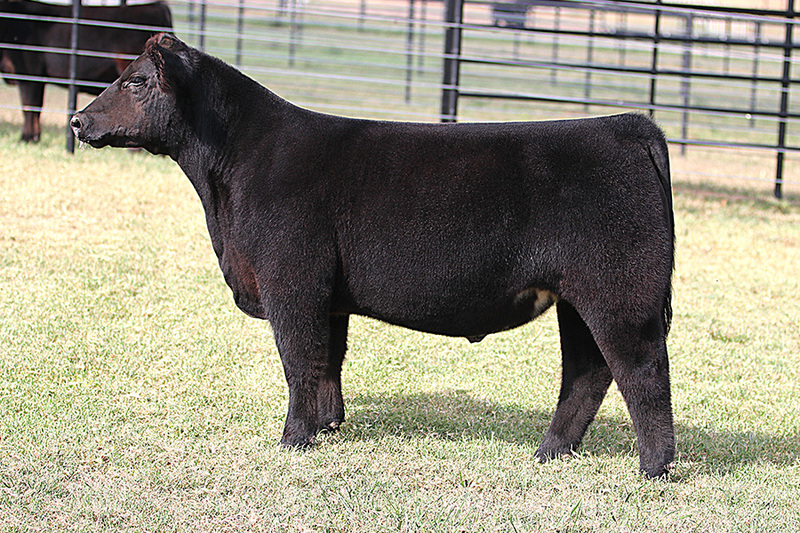 High percentage Chi female that is a full sib to the division champion Elder heifer at Fort Worth. This one is built right from the ground up. She is so right and true in her skeleton and soft in her body. She’s backed by the 910Y cow who raises good ones every single year. An 88x daughter out of an About Time x Cotton donor, proof is in the pudding with these genetics. 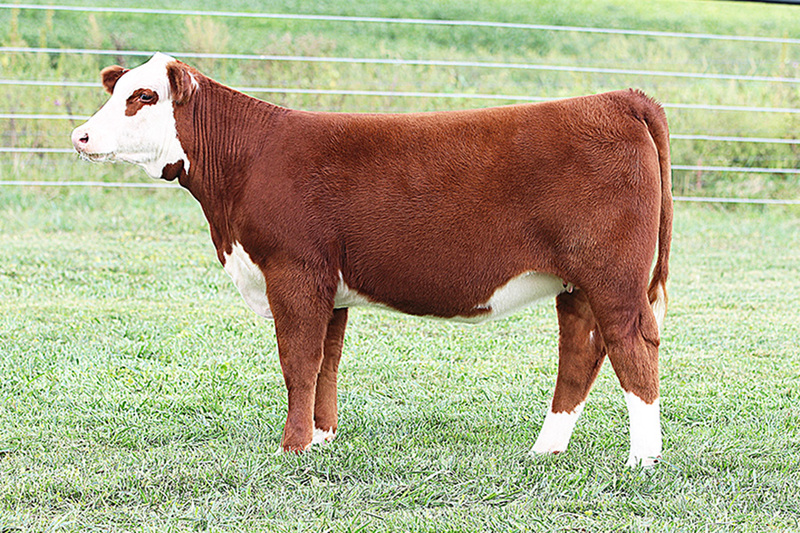 This ring-eyed polled heifer is super stout boned and brings forth added spring of rib and power from behind. Above this when she stops and throws her head in the air it makes you want to carry and camera with you 24/7. She’s the backdrop kind with a stellar genetic script to boot. Our first ever offering of a Lim-Flex female so we made sure she was a big time contender! 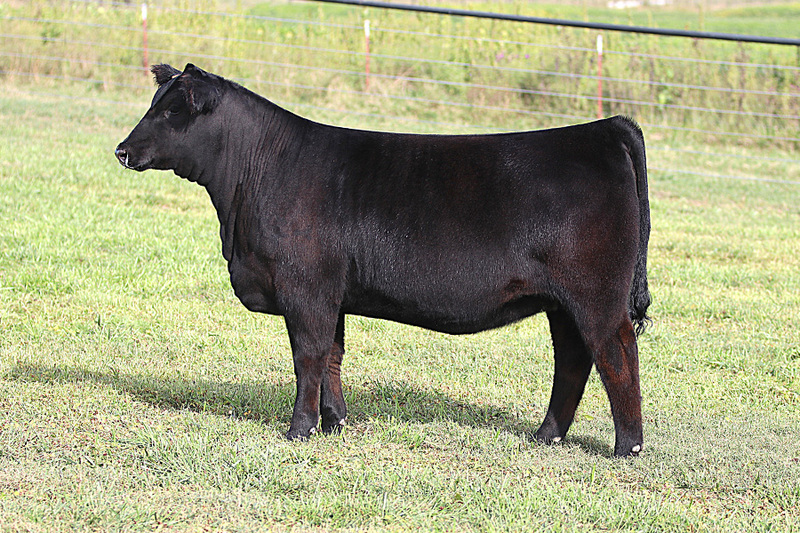 She is a Plum Creek Paradox out of a Yipselanti daughter that we purchased from John Sullivan. 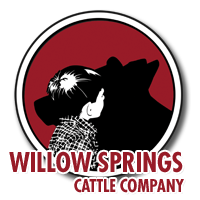 If you are as picky about good structured cattle as we are, then you are going to love this one. At the surface she’s got the big feet and squishy ankles. From here you have to appreciate how flat shouldered she is for having as much spread and curvature in her center body that she does. 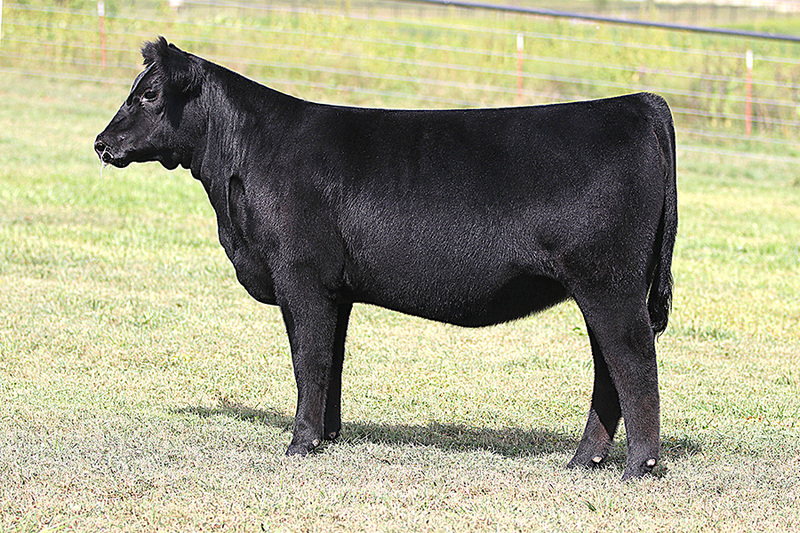 Another high caliber Chi Angus female who offers a truly productive and brood cow look. She’s got the perfect amount of width through her skeleton to where she’s flat and angular up front yet massive and opened up from her fore rib back. 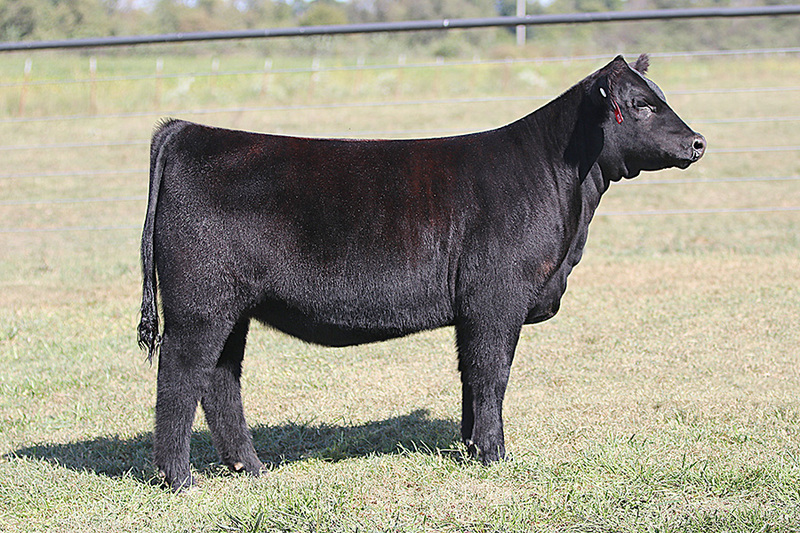 Full sister was Champion Chi Angus at Junior Nationals 2017. 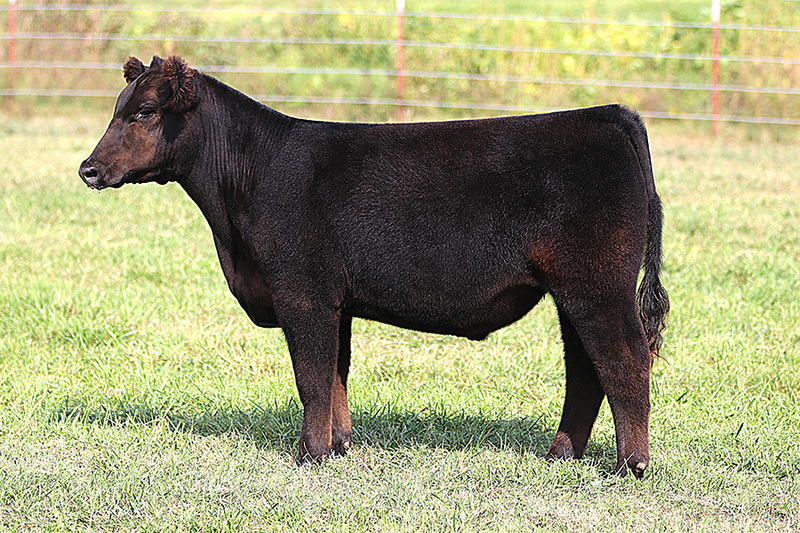 High Maine heifer who offers an extra showy look from the profile. Middle Man offspring are really making their mark on the breed for their extra body and balanced look. He didn’t miss here by the way this heifer’s neck flies out of the top side of her shoulder while from there back transitions into a big sweeping rib cage. At the ground, she’s deep heeled and takes a long, accurate stride. 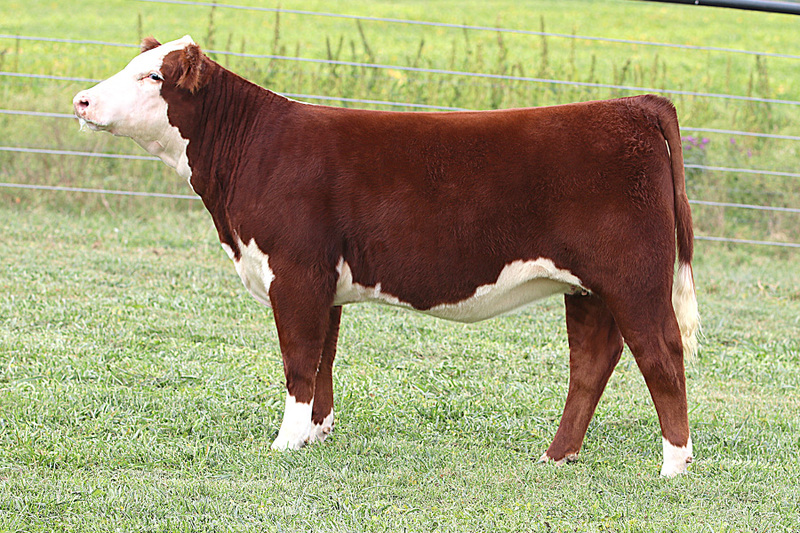 Here is a super cool marked May calf that sure has a bright future in the show ring. She is a Who Maker out of an About Time x Wynerno female who was the high seller from Geffert. This calf is really put together neat in her skeleton with extra body depth and pizzazz from the side. 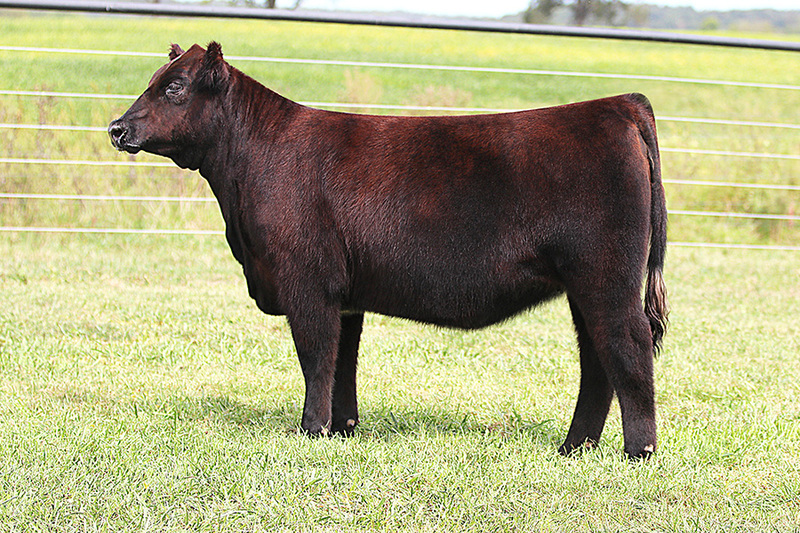 Big time bred heifer potential! This Wisdom daughter has all the right pieces to make it for the long haul. Long bodied and super attractive in her look and build. Give this girl some time and her true quality will shine through. Her dam was sure a force to be reckoned with being the Triple Crown winning Maine female in 2011. We think this one will be spot on for next years majors. Wowzer is right! This deep cherry red beauty is packed full of quality from both genotype and phenotype regards. 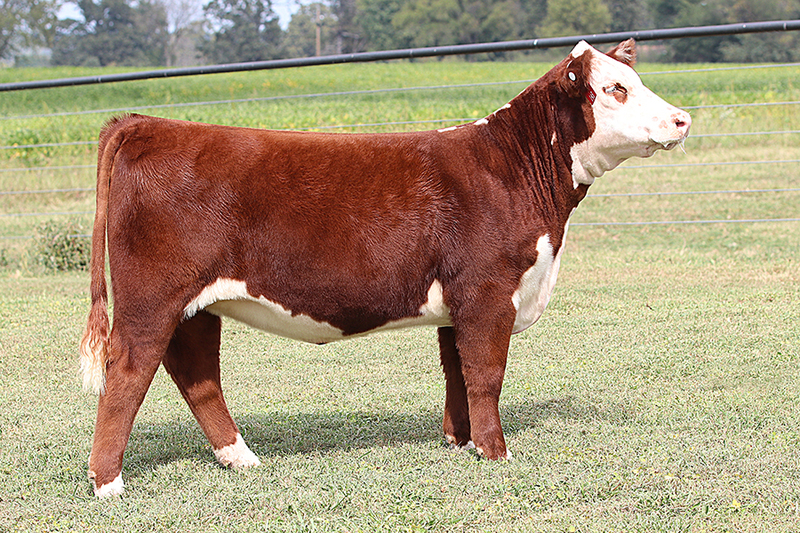 88x on an About Time x Cotton needs no introduction to the Hereford enthusiast. She’s sound, stout, huge bodied and way good looking. What more is there to say? 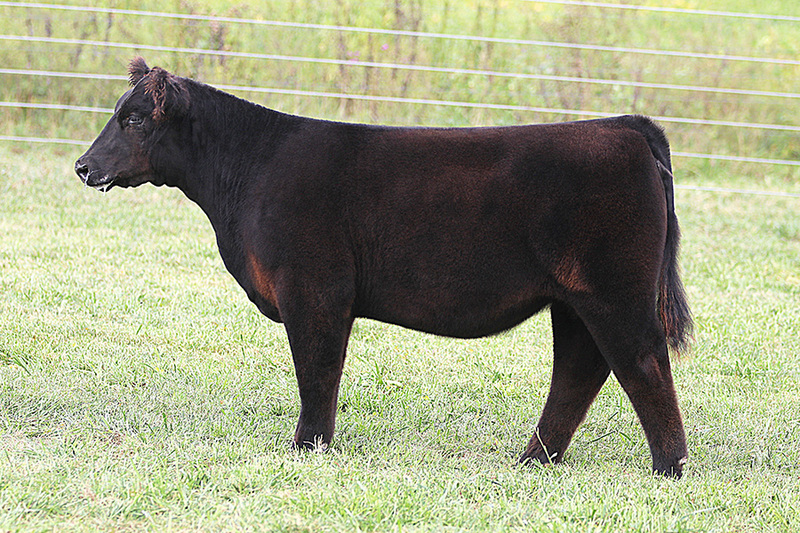 Percentage Simmental female by Broker and out of BPF’s The Beast’s dam. This girl can win shows and make a guy some serious cash. Super complete, problem-free cattle are our favorite. This female has all the bells and whistles with an out-of-this-world pedigree. 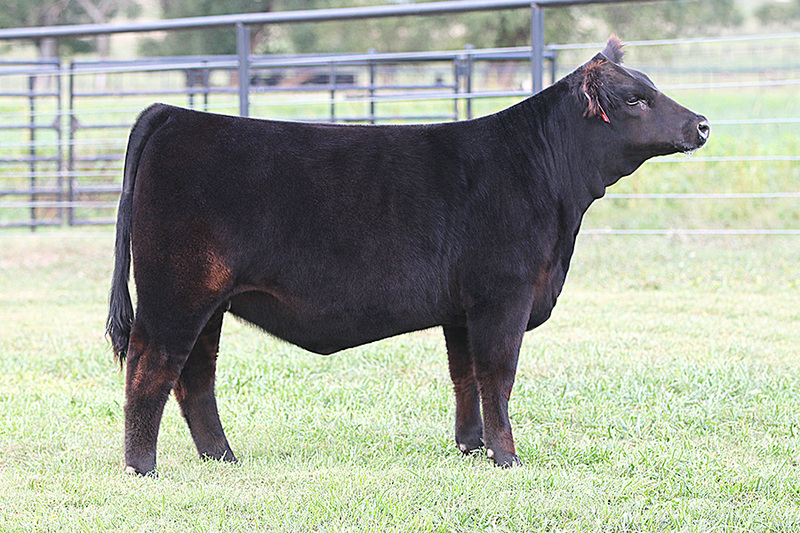 Another percentage Simmental Broker daughter that is powerful, yet practical in her basic build. She is massive in her body cavity and takes a big, long step. Cow power here boys! Check this stud out! 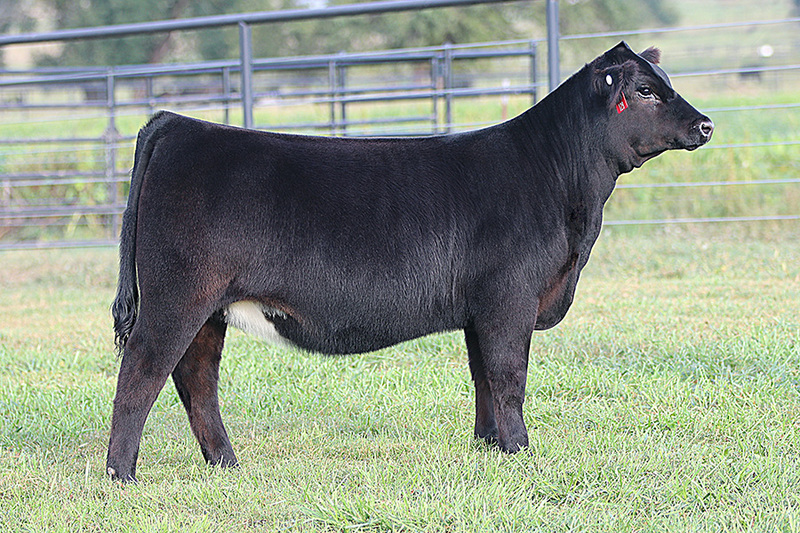 We don’t have an overabundance of show steers in this sale, but we feel that this guy can hang with the big dogs. Just as important as in females, we strive to raise good footed, sound cattle regardless of gender. This guy sets the standard at the ground where he’s got big paws that bend and flex the way they’re supposed to. From here up he’s big backed, soft bodied and has plenty of power in the seat of his pants. He’s the picture taking kind who is crazy long necked and has a good ear set. This Drivin 80 steer is sharp as a tack in terms of look and quality. He’s moderate and chunky in his kind and is packed full of muscle in still a sound and mobile package. Super good built and cool necked guy here. He’s a touch on the younger and greener side compared to his contemporaries, however, he will stay sound and should become a competitive fat. 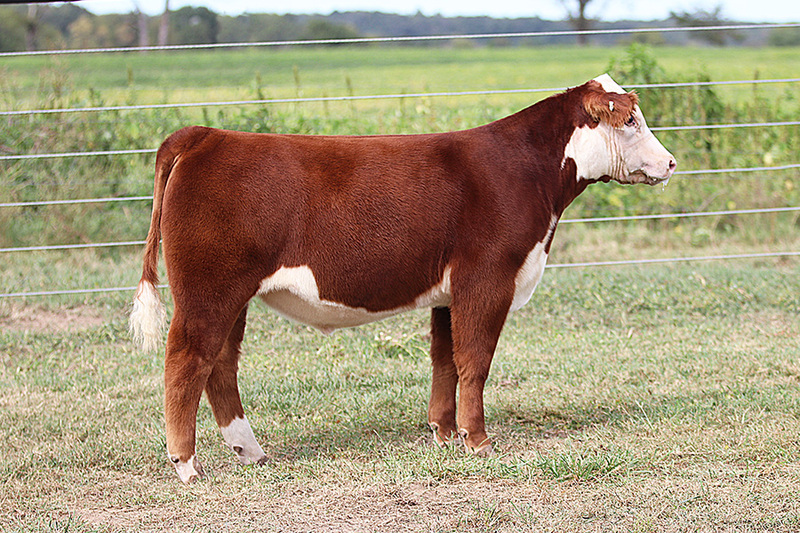 Purebred Hereford steer who will give ‘em a run for their money at Junior Nationals or any breed show. He’s expressive in his shape, sound and really cool to look at. 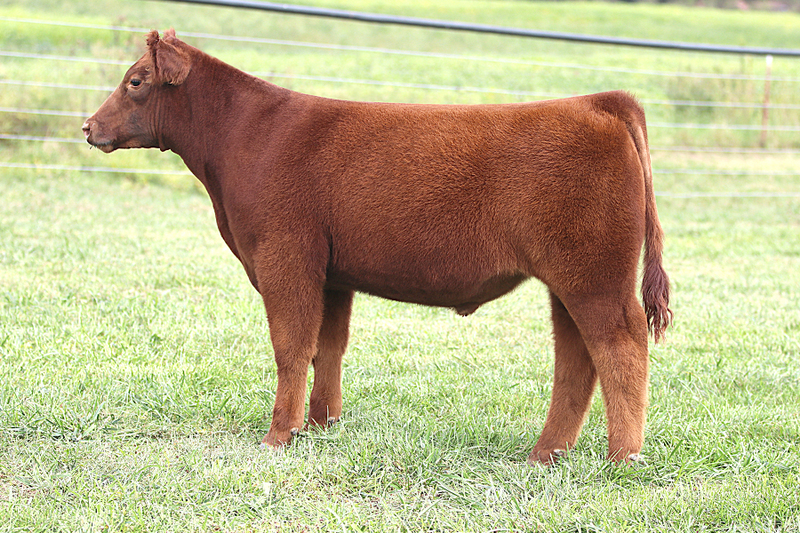 This red Solid Gold steer is sure one to keep your eye on. He’s a half sib to the promotional bull, Big Rig. He is awesome in his build and really cool from the side. Own this guy and look like a genius when he hits 1300 lbs.